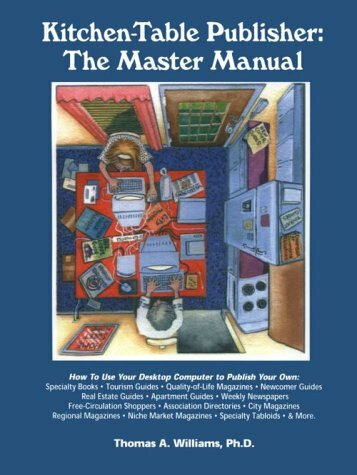 Kitchen Table Publisher: The Master Manual is one of a kind. It’s utterly complete pages constitute an open door to great financial success in publising at the home town and regional level. This how-to and operations manual is jampacked with details and techniques that will enable you to start and make big profits publishing you own city magazines, regional magazines, tourism guides, newcomer guides, association membership directories, apartment comparison guides, niche market books for local markets , Chamber of Commerce “quality of life” magazines, weekly newspapers, niche market tabloids and free circulation shoppers. All the trade secrets of cost management, price setting, market analysis, and much more are included in these pages. This information is not available from any other source. The author knows these publications will work because he has done them all m-- woth little or no cash up front and from his home-based office. In the course of doing so he learned the business inside and out. All you need is a simple desktop publishing system (or access to one), a desire to succeed, and the step-by-step know-how contained in these pages. In 1979 author Tom Williams bought a weekly newspaper, The Mecklenburg Gazette, Hen Davidson, North Carolina. He did it with no money down, by assuming the debts of the paper. In three years he increased circulation 400% and revenues by 1000%, and sold out to a newspaper chain for fifty themes the purchase price. He started and published many magazines, including Tar Heel: The Magazine of North Carolina (a state-wide magazine), The New East magazine, NCEast Magazine (regional magazines) and Washington Magazine (a cIty magazIne). His freelance artIcles have appeared In magazInes rangIng from EsquIre to Home OffIce ComputIng. He published association directories and chamber of commerce "quality of life" magazines, newcomer guIdes, and tourism guides. His company also published a chaIn of phenomenally successful apartment guides in seven major cities. His book How to Publish Your Poetry (Venture Press, 1991) was a WrIter's DIgest Book Club selectIon. Anotir book of mIne, How to Make $100,000 a Year In Desktop PublIshIng (Betterway PublIcatIons, 1990) was a best seller In Its fIeld. He learned how to do these things the hard way, hands-on. There were no books, no guides to follow. He learned, step-by-step, how to do It with virtually no money up front. He learned how to spot profitable opportunities, size up the competition, and position his publications for success. Niche-market publishing can be a very lucrative and personally satIsfying business. It's all in knowIng how.